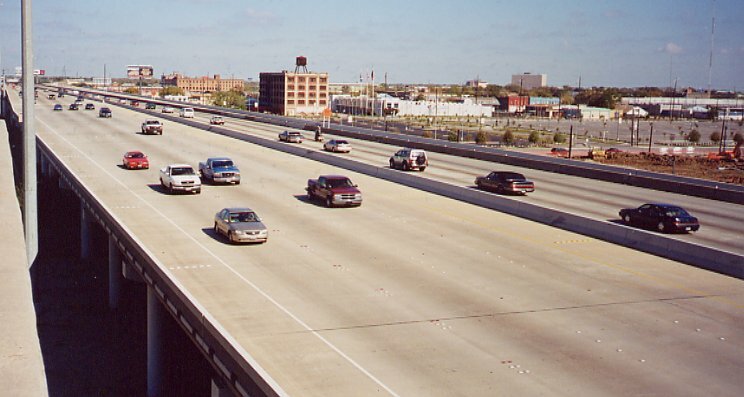 Page 1 of downtown Houston freeways | Page 2 of downtown Houston freeways. The I-10/I-45 merge just north of downtown, looking north. This wide and cluttered section of freeway is difficult to photograph, but hopefully this conveys some of the scope. This facility was constructed in the early-to-mid 1960's and remained basically unchanged until the addition of the elevated HOV lanes in 2000. 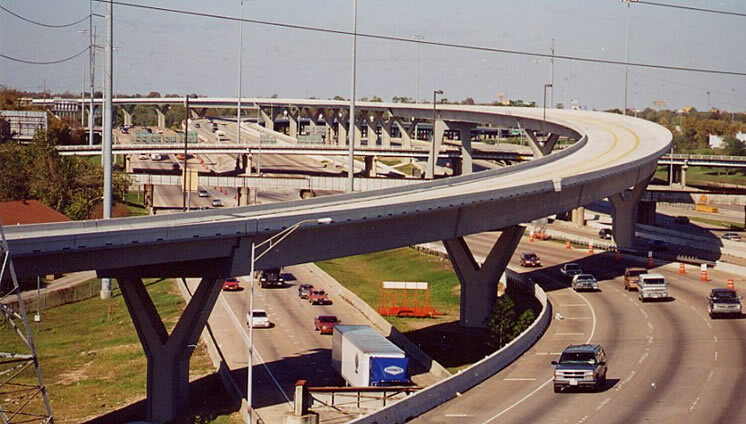 A view of the new elevated HOV ramp that dominates the I-10/I-45 merge. Interstate 10. Photo is taken from the Elysian viaduct, looking west. 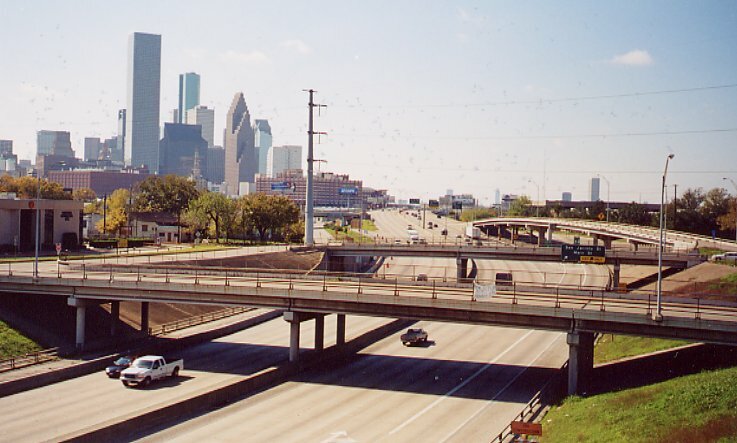 Interstate 10 is depressed in a trench, unlike the other freeways immediately surrounding downtown which are elevated. Interstate 10 is 6 lanes wide on the north side of downtown. It was completed in the early 1970's (probably around 1971). Interstate 10. Photo is taken from the Elysian viaduct, looking east. 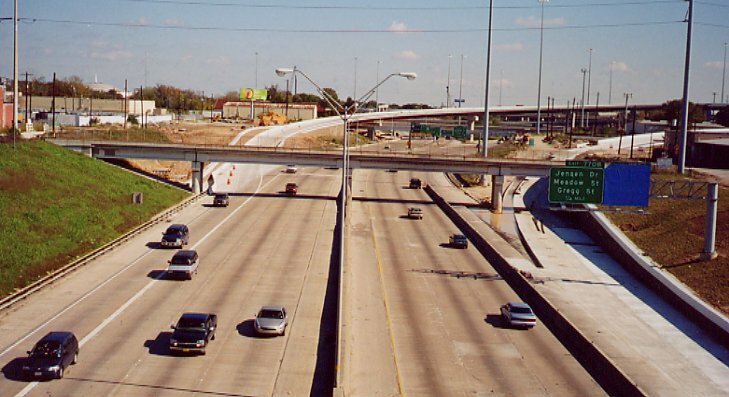 The brand-new connector from US-59 north can be seen merging with I-10 on the left side of the photo. It probably opened just days before this photo was taken. US59 on the east side of downtown is elevated. It was originally constructed in the early-to-mid 1960's. It was widened and re-decked in 1996-1997.